I Gotta Go With... 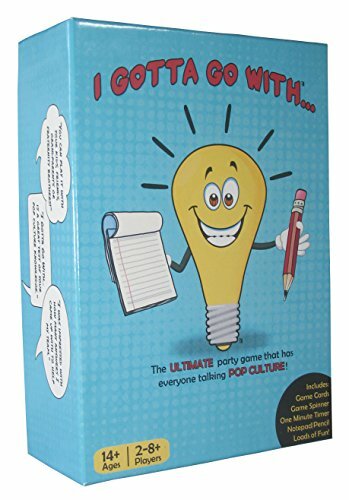 The ULTIMATE Party Game That Has Everyone Talking POP CULTURE! I Gotta Go With... is the new pop culture, party game that is competitive, addictive and loads of fun. It will leave you wanting more and answering questions days later. You have a minute. The team is depending on you, Movie titles that do not include the letter E.
Can you answer it? Go... How many did you get? Does the other team have more? Can you outsmart the other team and come up with answers you know they won't give? Celebrities that have a color in their name. There are a ton of answers! How many can you come up with, is the real question? TV titles that are 4 letters or less. Hmm... a little harder but the other team is already creating a list! Think! You know you have that info stored in your brain! It's fun for all ages! Your answers will depend on your age, background and interests. 200 cards that all have numerous answers about Pop Culture. Movies, music, television, celebrities, even a bit of sports - it's all in there! Absolutely everyone should be able to contribute to their team's success! I Gotta Go With... is the party game that is competitive, addictive and loads of fun. It will leave you wanting more and still answering days later. Pop Culture has never been this fun! View More In Card Games. If you have any questions about this product by I Gotta Go With..., contact us by completing and submitting the form below. If you are looking for a specif part number, please include it with your message.